Hongmei, our beloved au pair for the past two years left to go back to China last night. As I write this she is still on the LA -> Beijing leg of her route. It's going to be a long trip for her. The kids are not pleased that she is going. Margaret had a pretty epic meltdown at the airport when we said our goodbyes. We pretty much had to forcibly remove Margaret from Hongmei, and then she broke free and we had to peel her off again. For a kid who is still under 40 pounds, Margaret sure is strong. I'm just glad Warren could make it to the airport with us because there is no way I could have handled both kids on my own. The meltdown continued for some time after Hongmei was through security, and Warren had the excellent idea to go look at planes as a means of pacification. This lead to Margaret demanding Hongmei's plane. I think she meant she wanted to get on the plane with Hongmei, but the way she was phrasing it made it literally a demand that we give her the aircraft. In the end Warren bought both kids toy airplanes and that calmed them down enough for us to get them back to the car. Duncan was less dramatic at the airport. He'd just woken up from a nap, and was pretty oblivious about what was going on in spite of us talking about Hongmei's departure for the past few months. Ten minutes after we got home he said, "I want Hongmei." I showed him Hongmei's empty room. The demand was repeated at bed time. "I want Hongmei." When I failed to produce Hongmei he cried himself to sleep. I expect I'll be hearing "I want Hongmei" for the rest of the week at least. Warren and I will miss Hongmei too, or course. 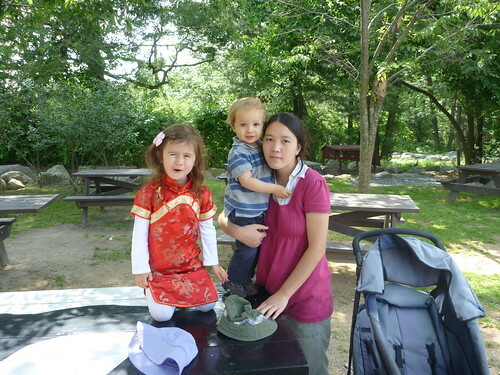 She was a good au pair, and she really loved the kids. On the other hand, we understand it's time for her to get on with her life and maybe have a child or two of her own. We wish her all the best.